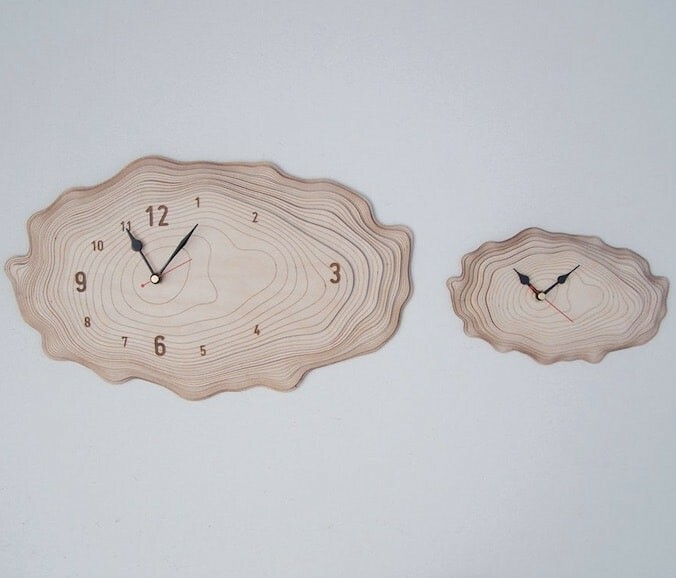 A decorative wall clock inspired by the growth rings of a tree. 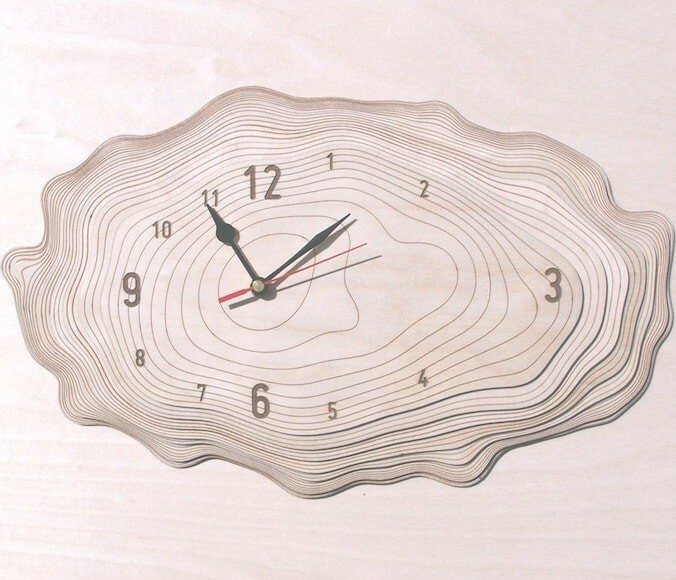 The clock is made of 7 layers of birch wood (cut to size with a laser cutter). The pattern is created by means of a “parametric design” during which natural processes are simulated on a computer. 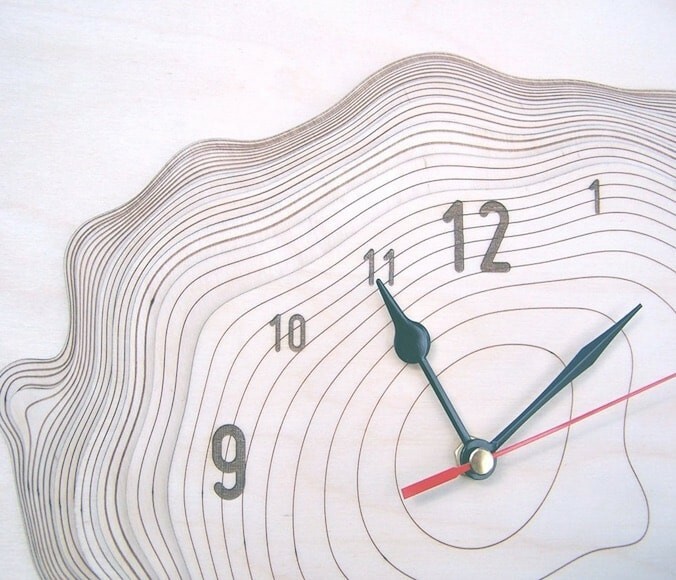 This wall clock is made of no less than 7 layers of laser-cut birch. Each layer represents a growth ring of a tree trunk. 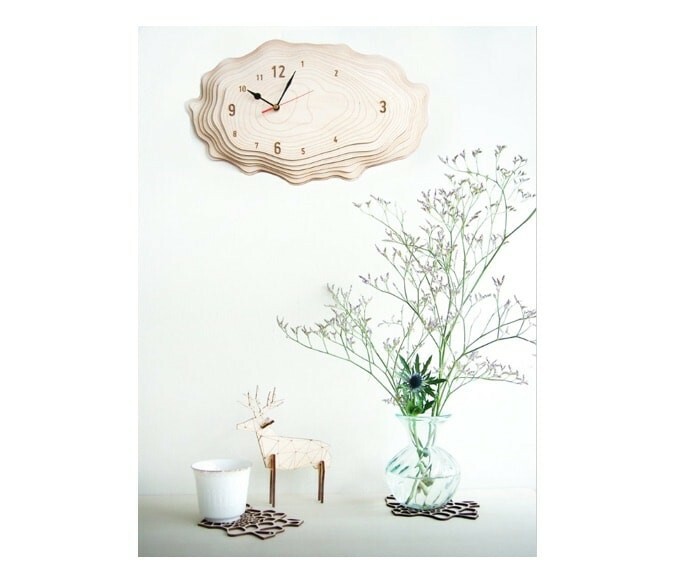 Like all Asymmtree designs by Anja Verdonk, the inspiration for the Bart clock is a combination of nature, architecture, and science. The pattern of tree rings is created by means of a digital process called ‘parametric design'. Simulating natural processes in a computer results in a rich diversity of patterns and endless variations. As only seen in nature. Every product is handmade, allowing quality to be guaranteed to the smallest details. 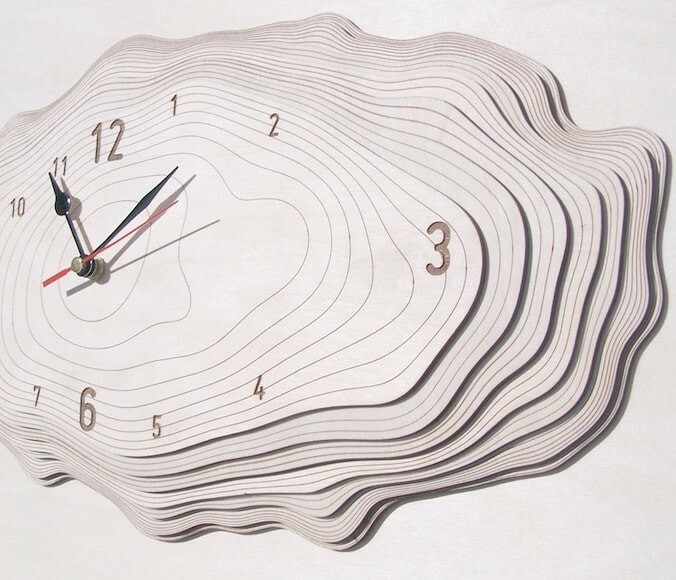 Seven layers of untreated birch (processed with a laser for the perfect size) give this clock its own personality. The front is finely sanded. The clock easily fits against a wall because the clockwork is embedded in the wood layers. The clock runs on één AA batteries (not included). Growth rings or tree rings are patterns that can be seen on a sawn tree trunk or branch (end grain). Trees - especially those that grow in temperate climates - have a varying growth rate of the outer layer of the trunk. Under favorable conditions, the tree grows rapidly and its cell are large and wide and the rings thicker; in bad weather the cells become smaller and the rings thinner. There is almost no growth during winter, especially with broad-leaved trees. These differences are visible as line patterns that form concentric rings. These are called annual growth rings. One can discover the age of a sawed tree by counting the number of rings from the edge to the center. Two rings represent one year. Because of alternating dry and wet, cold and warm years, growth rings of a varied thickness are created. All trees in a certain area display similar patterns. These patterns are used in dendrochronology. The eleven-year sun cycle (minimum and maximum solar activity) is also reflected in the growth rings. During maximum solar activity, the rings are thicker. To protect the clock during shipment, the clock mechanism has not yet been attached. You can easily do this yourself by tightening the included screw. The manual is included. Don’t you like the ticking sound a normal clock makes? We also offer clocks with a quiet mechanism. These clocks have no ticking sound but are very quiet. The mechanism still makes a soft, buzzing sound (coming from the clock wheels).